Special pregame segment highlights UCF alum's mission to make a difference. Football fans who tuned into ESPN’s broadcast of the Seattle Seahawks’ Monday Night Football matchup against the Chicago Bears were treated to a UCF-heavy night thanks to a special pregame feature on Shaquem Griffin ’16 and standout performances by teammates and fellow UCF alumni, Shaquill Griffin ’16 and Brandon Marshall ’06. Shaquem made history in April when he became the first one-handed player to be drafted in the NFL. He didn’t settle for just making the roster and worked his way into the starting lineup for the Sept. 9 season opener against the Denver Broncos. 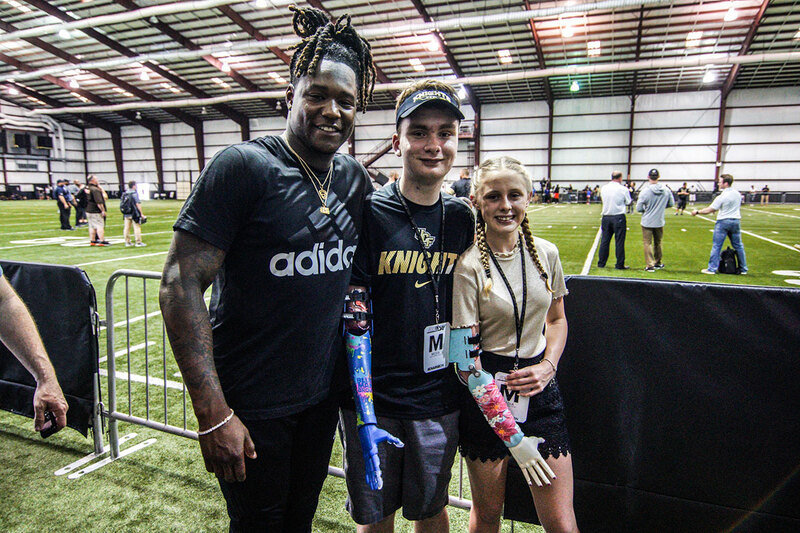 Although he didn’t start against the Bears, he did play and his story has inspired countless individuals, most notably children — like the recipients of 3D-printed prosthetic arms from Limbitless Solutions — who see themselves in him. So when a 90-second segment about Shaquem’s story aired across the nation just before kickoff, Limbitless Solutions CEO and co-founder Albert Manero ’12 ’14MS ’16PhD couldn’t help but beam not only for Shaquem, but also for several of the children who were part of the message to keep dreaming big. Griffin’s twin brother, Shaquill, who was drafted by the Seahawks in 2017, also had his moment to shine. Shaquill recorded four tackles during the game and added two impressive interceptions in the second quarter. Meanwhile, Marshall, who is featured in the Fall issue of Pegasus, emerged as the team’s second-leading receiver for the evening with four catches for 44 yards. The Griffin twins and Marshall join 12 other former Knights who are currently listed on NFL rosters. The No. 16 UCF football team returns to action this Friday against FAU at Spectrum Stadium at 7 p.m. on ESPN.